The next meeting is this Thursday 22 January, on at the civic library – 7:30pm. As well as catching up on all the fabulous projects you’d like to bring, we’re going to have a bit of fun doodling. I’ll take people through a few different free motion quilting designs and and we’ll practice them through doodles. Bring plain paper and pencils – lead pencil is fine or some coloured pencils / pens / textas. I’ll also have some spare paper and pencils. Looking forward to seeing what everyone’s been up to over the break and new year. Welcome to the second part where we learn more about Danielle. Is there a technique on your list to learn this year? How do you like to learn new techniques? I would love to do more foundation paper piecing. I have done a few blocks here and there (all bee blocks, I think!) but would love to do something of my choosing and for me. I like to learn by just jumping in, perhaps reading a tutorial or two and maybe having a friend to sew the same thing with so we can help each other and laugh at our mistakes instead of despairing alone. Another technique I’d like to try is top-down or open seam piecing. 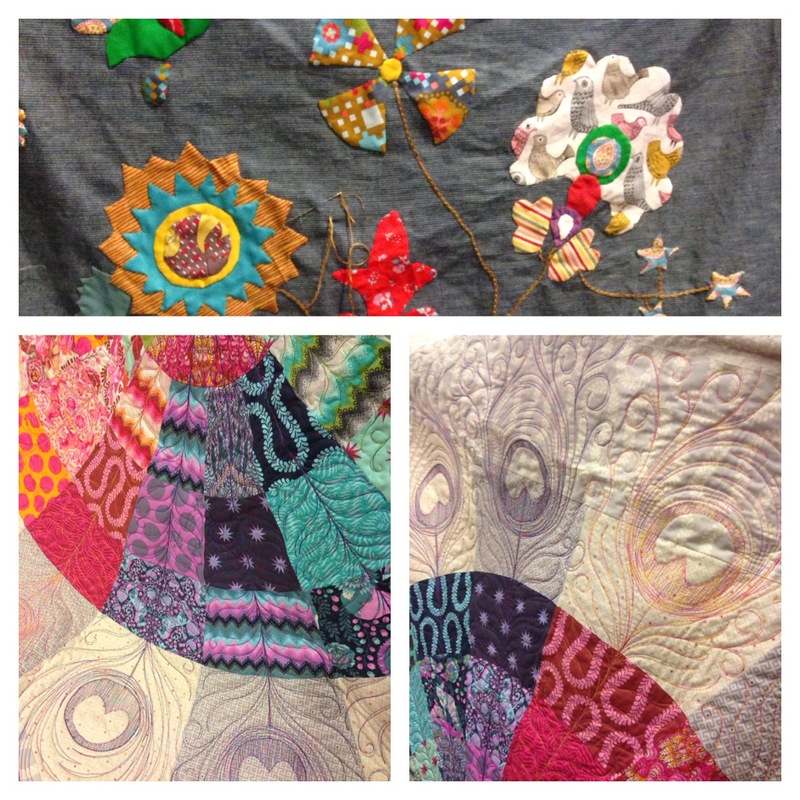 Sarah Fielke’s quilt In the Night Garden is made using this technique and it’s a stunner! One of the things I really love about quilting is how there is inspiration everywhere, even in the most unlikely of places. I don’t know how many times I’ve seen a pattern on a floor, or a wall, in a building, even on packaging, and thought, that could make a quilt! I love going to friends’ houses who have older style bathrooms because very often there will be an amazing tessellated tile pattern on the floor or walls. I’d love to say that every time I see an object in this way that I rush home and whip up a quilt, or at least draw the pattern and save it for later, but sadly that’s not where my headspace is right now – I’m hoping that in years to come when life is not so crazy that I will have a lot more time to reflect on design and nature and turn my ideas into all the things! Of course in the meantime there is inspiration non-stop if you choose to engage in social media – sometimes I think there is too much! I’m constantly astounded by how many people just like me there are all over the world, with the same motivation to make beautiful things. It has been wonderful to connect with people long distances away in an instant, and I’ve made some very close friendships with lovely people I’ve met online (and have been lucky enough to meet some of them in real life too, while on holidays in the UK and US). Who are your quilt idols? It is hard to narrow my quilt idols to one or two. I’ll start with fabric – my absolute favourite designer would have to be Anna Maria Horner. Her colour palette is my idea of perfection, pretty much anything she brings out I love. First and foremost it’s about the colour, or the combination of colours, but secondly it’s the drawings – Anna is an artist above anything else, and I love that she shares her work and her inspiration on her blog and on Instagram. I also love Denyse Schmidt – I love how she borrows from vintage fabrics and re-interprets them with a modern style and colour palette. 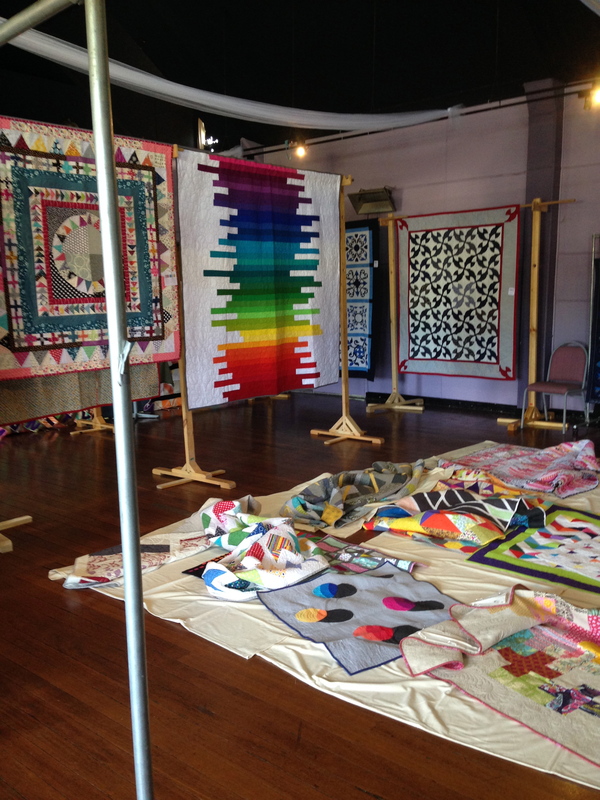 And the simplicity and crispness of her quilts make them a stand out for me. Recently I’ve fallen in love with Carolyn Friedlander’s fabrics – Carolyn has a background in architecture and her fabric designs (and quilt designs) very much reflect this; they are very geometric and line-based, in soft but contrasting colours. 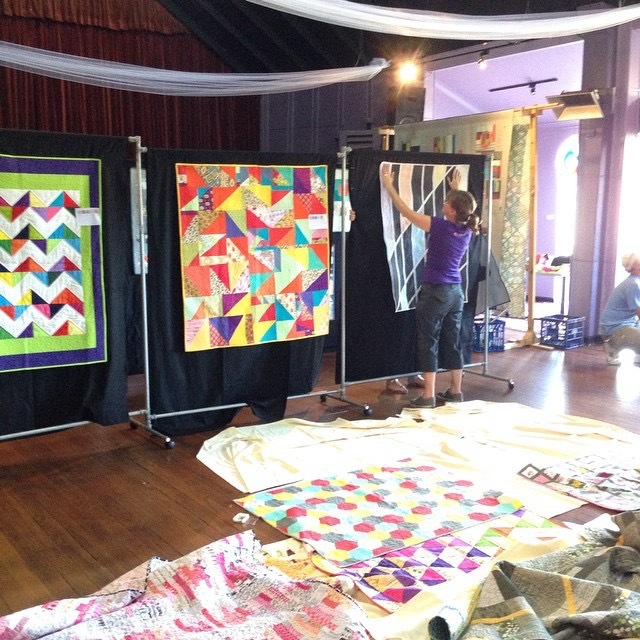 Sarah Fielke, an Australian quilter and designer, has been a big influence on me. I love her use of colour, and am a big fan of appliqué and hand quilting, both of which Sarah employs by the bucketload. 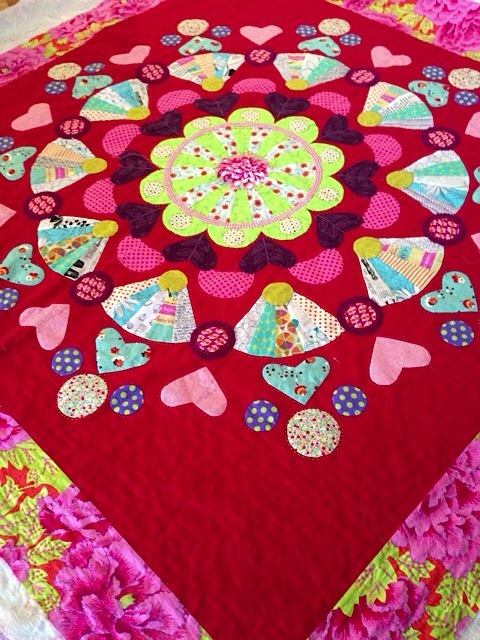 One of my favourite quilts I’ve ever made is her Millefiori pattern, all hand quilted and appliquéd. Jen Kingwell, another Aussie, is a big favourite too. As I’ve already mentioned, I’m part-way through making her Green Tea and Sweet Beans pattern, and have several other of her patterns lined up for next year (and beyond). Again I admire her use of colour and envy her ability to throw such eclectic mixes of fabrics together as if they always belonged that way. What five things or people are inspiring you right now? 1. 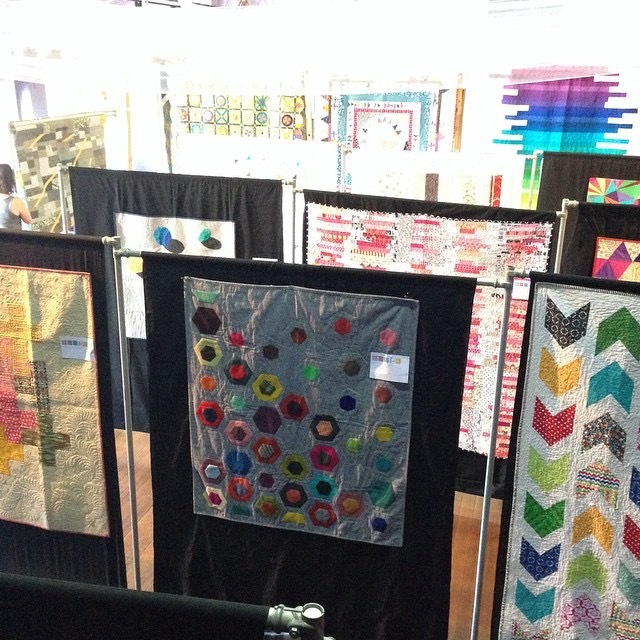 Antique quilts – People have been making quilts forever – I feel it connects us with the past and I see my quilts as part of my legacy. I love looking at antique quilts in books and online (there is a great catalogue on the Victoria and Albert Museum website), and one day I would like to tackle a reproduction of an epic antique quilt. I’m thinking I might start with the 1718 Coverlet, which is an English quilt, pieced and appliquéd, and recently reproduced and published with its own book. 2. Blue Elephant Stitches – I love Jolene’s quilts – they’re not fancy, they’re just simple, and beautiful. 3. Flossie Teacakes – Florence makes the most beautiful things, she always has some EPP on the go and invariably it involves Liberty. I also love the way she writes – I hope she’ll come out with a book one day! And she has a very cute puppy. 4. 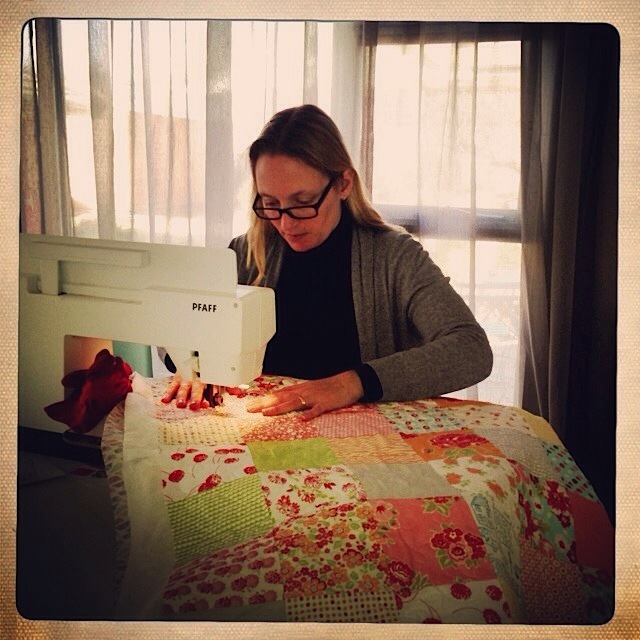 Make Something – I’ve followed Karen in Toronto since I rediscovered sewing a few years ago. She makes fabulous clothing (something I would love to do more!) as well as the occasional quilt. 5. Japanese modern quilters – they have a style that is all their own. I’ve recently discovered Patchwork Tsushin magazine, which is a treasure trove of incredible quilts (primarily what we would describe as modern). Unfortunately the magazine is only available in Japanese, but the photography is wonderful and the patterns have clear diagrams and measurements included. Japanese fabric designers are also worth seeking out for their modern fabrics – some of my favourites are Suzuko Koseki (who specialises in modernising retro motifs), Kumiko Fujita, Kei and Keiko Goke. With this post we have another very talented guild member, Danielle. To start, tell us a little bit about yourself! What got you interested in quilting? 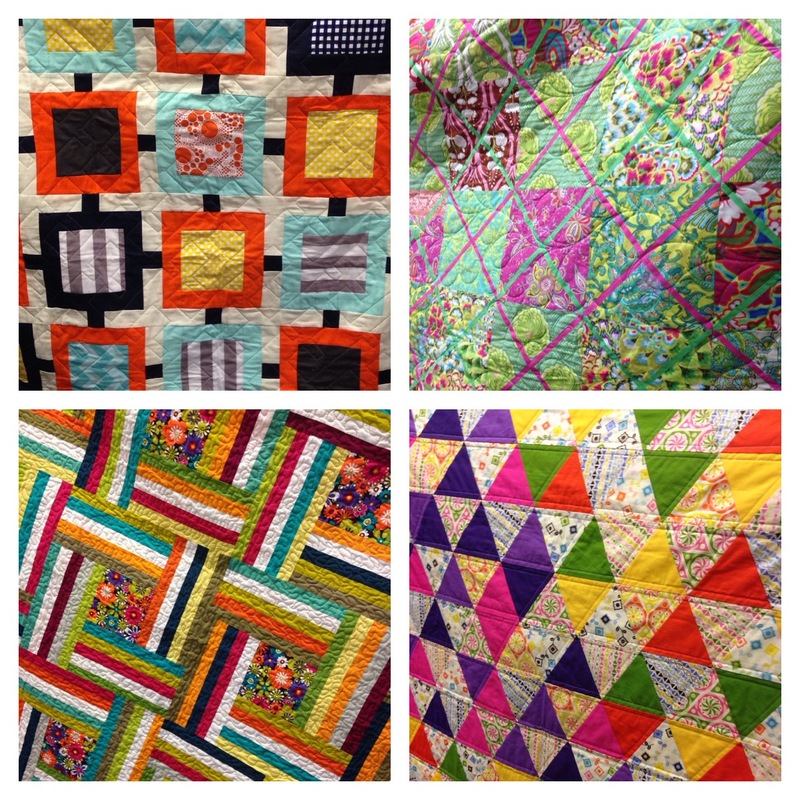 When did you first find modern quilting? 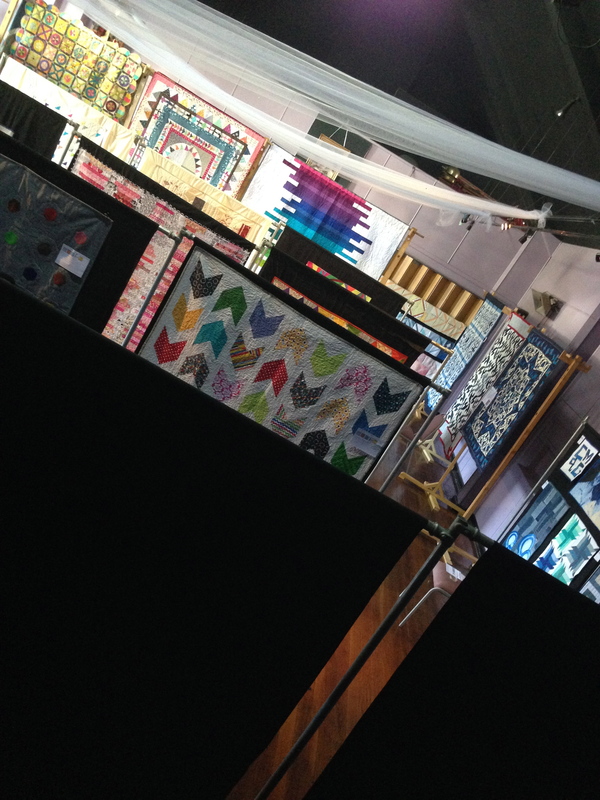 It’s a little hard to say how long I’ve been quilting, it’s been something that has evolved over quite a few years. I grew up surrounded by craft, my Mum was a dressmaker and made all my sister’s and my clothes when we were little. She did a course at TAFE and was even proficient at making bras and undies although I don’t think she particularly enjoyed that part of the course and nobody in the family ever benefited from that. We did, however, have a wardrobe of beautiful dresses and other pretty things. My Nana (Mum’s mum) was also a prolific sewist, as well as a knitter, spinner and weaver. She taught me to knit when I was about seven, but before (and after) that I remember trying my hand at the spinning wheel, and my grandfather made me a mini version of her loom. Family holidays at their home in Cooma were very crafty, and it was there I learnt to appreciate the cosiness of sitting by the fire with a cuppa and my knitting. I’ve always been a Nana!! I knitted and cross-stitched my way through uni but it wasn’t until I had a proper job that I took a real interest in quilting (my Mum – and Nana – had by that stage made a definite shift from dressmaking to quilting) – I must have known that some income would be required to support this hobby! I started hand-piecing blocks (they were never sewn into a quilt), and made a couple of quilts for friends’ babies, always with help from Mum. It wasn’t until the first wave of more modern fabrics arrived (around 2009) that I became really swept away (this was around the time i discovered quilting blogs too!) and the sewing (and fabric collecting) frenzy began. I spent a lot of time lurking on modern quilting groups on Flickr, and participated in quite a few swaps and bees. The first quilt Mum made for me is now over twenty years old and still lives on our couch – along with another she made for my 30th birthday – and I love to see my kids snuggled up under them now, one of the reasons I love quilting and making so much. Do you do any other craft besides quilting? My early efforts in quilting consisted of a lot of blanket stitch appliqué, my (very small!) fabric stash was quite cottagey, and probably the only fabric designer I knew by name was Debbie Mumm. Nowadays my style is much more eclectic, I like saturated colours but I also love to mix things up a bit – a repro 30s style flowery print can look quite at home next to a bold geometric black and white print. I’m learning a lot about what I do and don’t like, and which fabrics work together, through the online fabric shop that I run with my friend Jeannette Bruce, Polka Dot Tea. Well, there is a large number of WIPs, I can’t deny it. 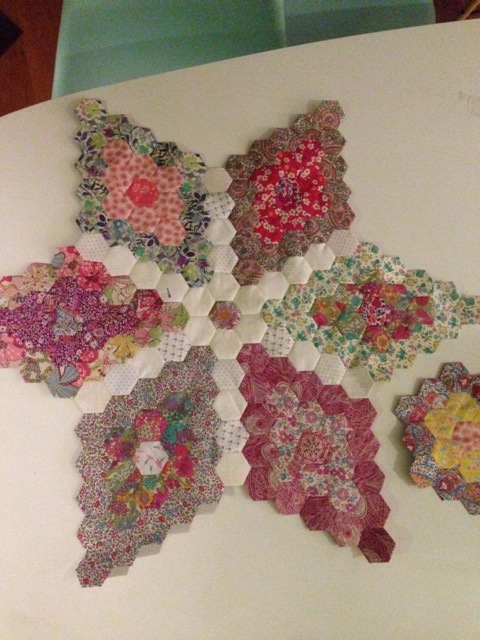 But the main projects I’m working on are a few EPP (English paper pieced) quilts – I’m addicted to hexies, and I can see myself making at least one hexy quilt every year into infinity. I love hand sewing and I’m rarely sitting down doing nothing, there are always hexies to be stitched or basted, appliqué to be stitched, or hand quilting to do (and if not, there’s knitting). I am about 70 per cent through making Jen Kingwell’s Green Tea and Sweet Beans quilt, which is a mixture of appliqué, hand and machine piecing, and I really must pick it up again. In terms of machine pieced quilts, I have a second Swoon quilt well underway, and a number of others in various states (farmer’s wife, granny squares, butterflies, to name a few) – I’m trying to get through a few in order to allow myself to start on some new projects. What is your favourite part about quilting? What is your least favourite? My favourite part is probably making the individual components of blocks – I really dislike sewing rows of blocks together, but by that stage I just want to get the thing finished so I don’t stop! And of course I love stitching hexies and appliqué. 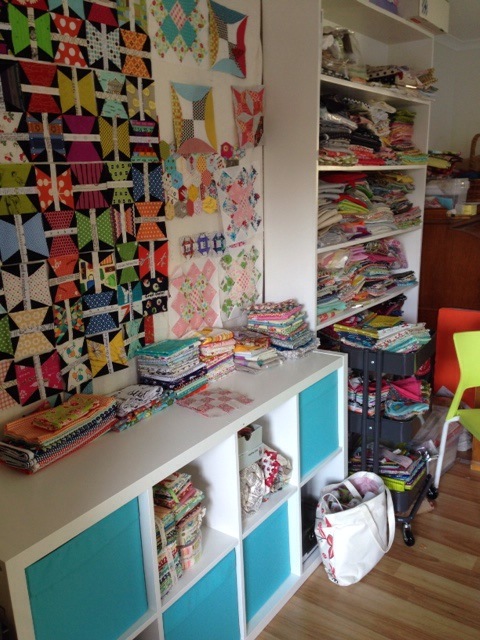 Show us your sewing space! What’s the best thing you ever bought into it? My sewing space is one of my biggest WIPs, but it should be finished soon, I hope. I’m lucky enough to have our converted garage as a studio, but I’m still in the process of getting it organised. My Dad made me a fantastic cutting bench with storage underneath. So currently my sewing space is the dining table – and my husband is very tolerant of my piles of fabric which tend to accumulate there (and yes, other places around the house too). I like to sew at the table though, it means I’m in amongst everyone and can still be with the kids. Hanging out on Instagram (@petitselefants), or in the shop (polkadottea.com). My blog (mespetitselefants.blogspot.com) is quite neglected these days but is a good record of a lot of my work. Thanks Danielle for telling us about yourself. Can’t wait until the next post where we’ll learn about her inspirations and what technique she’d like to learn next.